BANGKOK: Gen Prawit Wongsuwon borrowed 22 luxury watches from a friend, who is now dead, not 25 as reported by media, according to the National Anti-Corruption Commission. NACC secretary-general Worawit Sukboon said yesterday (Mar 29) that the deputy prime minister had given information about the watches he was seen wearing to the NACC four times. “We found he had worn 22 watches, not 25 as reported by media earlier, since three of them are in fact the same watch,” he said. The diamond ring he was seen wearing belonged to his father. His mother kept it before giving it to him, Mr Worawit added. The NACC board met yesterday to discuss the case and decided more information was needed. The board told the NACC to verify the ownership of the watches and question two more witnesses. It also needs information from 10 watch distributors which have yet to respond to the NACC. The board instructed the NACC to report the findings as soon as possible. It has not considered whether to invite Gen Prawit for questioning. At the board meeting yesterday, NACC president Gen Watcharapol did not attend to avoid criticism as he was a former aide to Gen Prawit from Sept 16, 2014 to Oct 1, 2015. 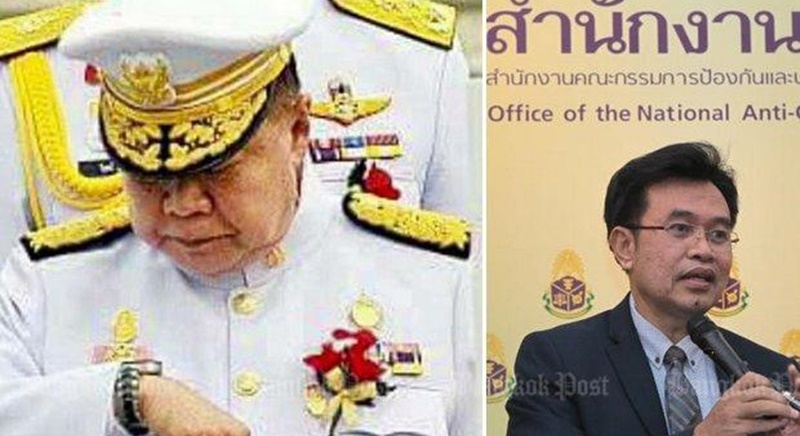 The NACC law requires politicians to declare assets twice – when taking and leaving office – and Gen Prawit did not declare the watches and diamond ring when he became deputy prime minister and defence minister in September 2014. Tick tack, just buying time, hoping that soon something else more sensational is coming up in press. Than Pom Prawit's case slides off the table. Same as that demoted abbot of the rich flying saucer temple and the Red Bull boy.